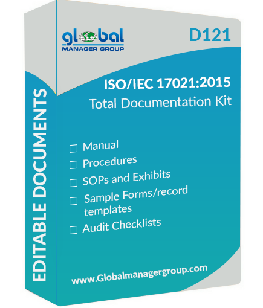 What Global Manager Group’s ISO/IEC 17021:2015 Documentation Kit Covers? ISO 17021 is a series of standards that set out requirements for organizations who provide certificates of conformity to all types of management systems. These organizations are commonly referenced to as certification bodies or registrars. The ISO 17021 standards are used by accreditation bodies to assess the processes that certification bodies have in place to ensure that they are impartial and the results of their assessments are consistent. Global Manager Group is involved in documentation selling since 1995; ISO/IEC 17021:2015 Documentation kit is one of the most selling document products of the company. ISO 17021:2015 accreditation documents requirements for bodies providing audit and certification of conformity assessments systems, is intended to increase trust in management system certificates issued. Global Manager Group’s aim and purpose of providing ISO 17021:2015 documents is to increase the value of conformity assessments systems certification. What ISO/IEC 17021:2015 Documentation Kit Includes? ISO 17021 manual: It describe profile, amendment sheet, index, clause wise details as per ISO/IEC 17021:2015 for implementation, sample quality policy and organization chart. This documents standard requirements of ISO/IEC 17021 accreditation system implementation as well as quick certification. ISO 17021 Policy: This document cover topic of mandatory policies covering all the details as per ISO/IEC 17021:2015 requirements for Certifying Body. Mandatory Procedures: This document for conformity assessment covering mandatory procedures details like purpose, scope, responsibility, how procedure is followed as well as list of exhibits, reference documents and formats. Work Instructions: This document is guideline for establishing controls on significant aspects, work instructions for operators as well as standard operating procedures. This documents very useful for testing process control and establishes effective laboratory management system with good laboratory practices culture. ISO 17021 Audit Checklist: This document is tool for the internal to make audit questionnaire while auditing and make effectiveness in auditing. ISO 17021:2015 Checklists document requirements for ISO 17021:2015 standard and implementation of accreditation system. How to Structure Health and Safety Documentation According to ISO 45001:2018? How Global Manager Group’s EQHSMS Documentation Kit Helps You? Copyright © 2019 ISO Documentation, ISO Training and ISO Consultancy Blog. All Rights Reserved. Powered by Wordpress | Theme Powered by bedroom wordpress themes and provided by sports tickets online for free.